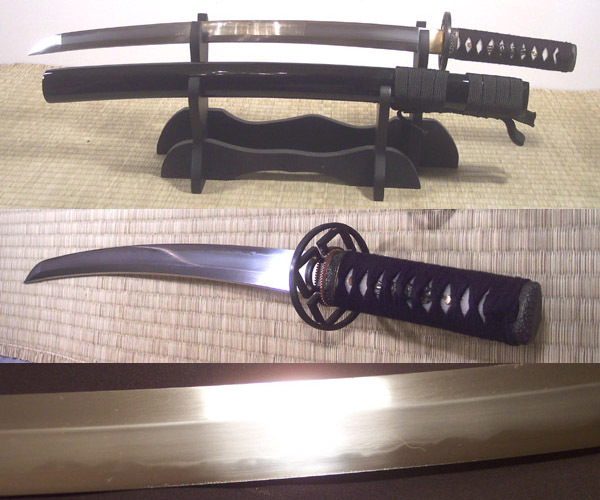 This is the one handed Wakizashi companion sword for our extremely popular Kaze katana. Material and design made to be a matching set with our BROWN ito version of the Kaze Katana... (PLEASE NOTE THAT THE BLACK ITO VERSION PICTURED IS AN EARLIER MODEL, WE WILL BE UPDATING OUR PICS SOON). Sharpened functional cutter especially effective against traditional targets such as Tatami Omote - it features a 6.5" tsuka and uses double mekugi. Key feature of this particular Wakizashi is the differentially clay hardened blade with the visible natural hamon as is on our Kaze Katana. 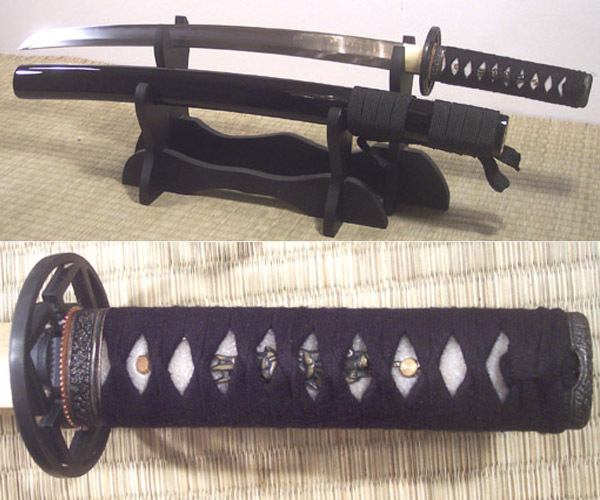 As is with our latest version of the Kaze, this sword uses a double mekugi with one being bamboo, and the other being brass for additional tsuka reinforcement – as well as a slightly shallowed same channel and upgraded ito. Complete your authentic daisho collection with this piece (order together with the Kaze Katana and get an upgraded double sword stand! ).